The high-sensitivity troponin assay may identify low-risk ACS populations. Patients with suspected acute coronary syndrome whose care incorporated a high-sensitivity cardiac troponin diagnostic assay using a 99th percentile diagnostic threshold did not see a reduction in subsequent myocardial infarction or cardiovascular death compared with those treated with standard threshold levels, according to a recent study published in The Lancet. Rates of subsequent myocardial infarction or death from cardiovascular causes 1 year after initial presentation were compared in patients with suspected acute coronary syndrome across 10 secondary or tertiary care hospitals in Scotland. This stepped-wedge, cluster-randomized controlled trial split the hospitals randomly into early (n=5 hospitals) or late (n=5 hospitals) implementation of the high-sensitivity cardiac troponin diagnostic assay using a 99th percentile diagnostic threshold. Outcomes were compared in patients reclassified by the high-sensitivity assay before and after its implementation. 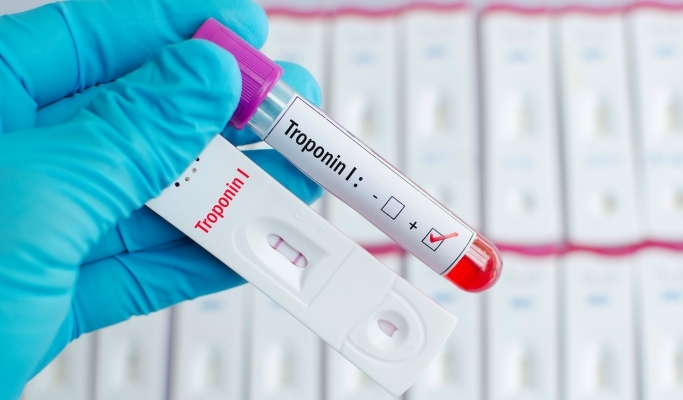 Among the 48,282 patients enrolled in the study, 10,360 patients exhibited cardiac troponin levels greater than those of the 99th centile of the normal range of values. These patients were classified as having a myocardial infarction by both assays. A further 1771 patients were identified by the high-sensitivity assay but not by the contemporary assay. In those patients who were reclassified, subsequent myocardial infarction or cardiovascular death within 1 year occurred in 105 of 720 patients (15%) in the validation phase and 131 of 1051 patients (12%) in the implementation phase.